Since I’ve embarked an a quest to bake a new recipe at least once a month, I knew that my February baking adventure would be for my husband’s birthday. The question then was how to create the perfect cupcake for him? Well, he loves chocolate. He loves peanut butter. 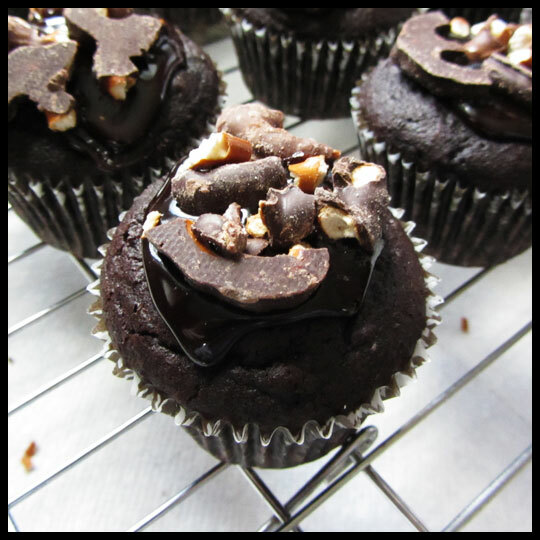 And I recently discovered that he loves chocolate covered pretzel cupcakes (this can be credited to Baked by Melissa‘s December Mini of the month, Snow Covered Pretzel). 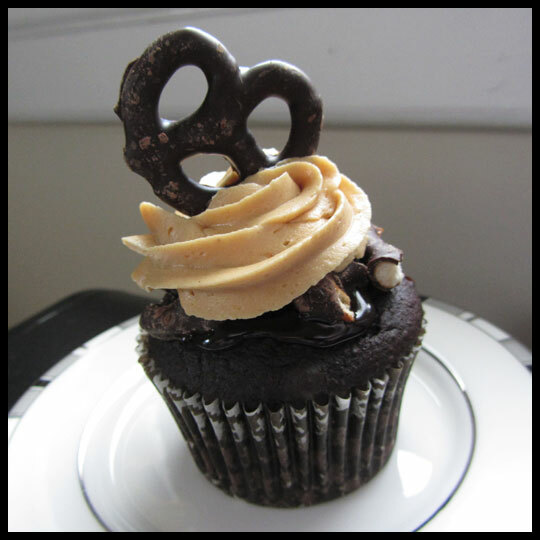 With all this in mind, I decided to create a Chocolate Covered Pretzel cupcake with Peanut Butter frosting. Knowing that I’m not a baker, I decided to start with Duncan Hines Moist Deluxe Dark Chocolate Fudge cake mix, Duncan Hines Chocolate Amazing Glaze, and store-bought chocolate covered pretzels. However, I wanted these to be extra special, so I was determined to make a frosting from scratch. I started with the cake mix. After doing some online research I found out that by adding a box of Jell-o pudding mix to the dry ingredients in the box mix, the cake would be a little more moist and rich. Since it was a special occasion, I decided to give it a try. After the cupcakes were baked and cooled, I followed the heating instructions from the bottle of Duncan Hines Chocolate Amazing Glaze and added a bit of it to each cupcake before topping it with crushed up chocolate covered pretzels. The final step was to make the frosting. After going through a ton of recipes, I settled on one I saved a while ago from the blog, Dame Good Eats. The instructions from the blog called for a stand mixer, which I don’t have, so I made do with my hand-held electric mixer. I also don’t have a food scale, so after some simple math, I decided to use about 1 3/4 cup of confectioners sugar, which I did not sift because I also don’t have a sifter. (See? I’m not joking when I say I’m not a baker). In a stand mixer, beat the butter until smooth, on low. Slowly add in confectioners sugar, once incorporated, beat on medium for about a minute. Add in the peanut butter until creamy, then add in vanilla. Once incorporated, add in whipping cream until frosting reaches desired consistency. Beat on medium for about a minute. (scrape down the sides throughout as needed so that all of the ingredients are getting incorporated equally into the mixture). At first, the frosting tasted a bit too much like confectioners sugar so I ended up adding in a little extra peanut butter. My guess is that my math was a little off and I used too much confectioners sugar. I also used all 4 tablespoons of heavy whipping cream. In the end, it turned out perfect! After pipping the frosting I topped it off with an un-crushed chocolate covered pretzel. I was super happy with the visual appearance of this cupcake. I don’t usually like to toot my own horn, but I felt like these were pretty enough to sell at a bakery. As far as flavor goes, the peanut butter frosting was the shining star of the cupcake. It was smooth, creamy, and had the perfect peanut butter flavor. The cake was okay. It wasn’t as rich as I would have liked it to be, but it wasn’t awful either. It was a box mix, so you just have to accept it for what it is. However, I still plan to continue experimenting with making box mixes better. Also, next time I think I would not crush up the chocolate covered pretzels before placing them on top of the glaze (under the frosting). I think that because of all the moisture, those pretzels ended up getting a little soft. But that’s an easy fix, so next time I will just place a full pretzel on top of the glaze. Overall, these cupcakes were easy to make, pretty, and very tasty. I would say this was a definite baking “win” for me. Do you have any baking plans this weekend or this month? Let us know! We’d love to hear about it! 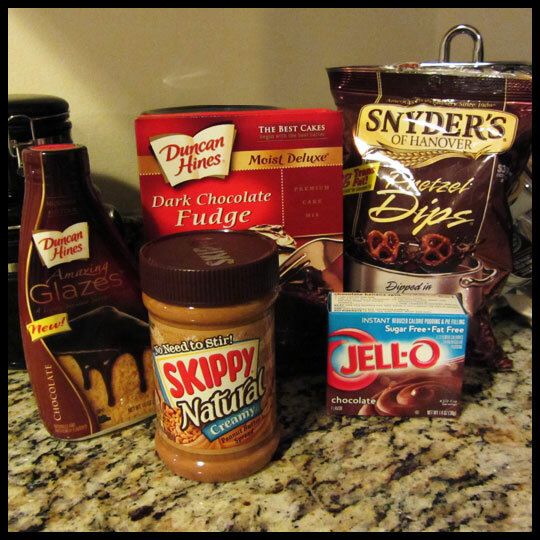 This entry was posted in Baking, Baltimore, Cupcakes and tagged Baking, Chocolate, chocolate covered pretzel, Cupcake, duncan hines, Glaze, peanut butter, Pretzel by Stacy. Bookmark the permalink. Toot your own horn all you like – these definitely look bakery worthy! Mmmmmm. wow these are gorgeous! what is better than a chocolate covered pretzel?! I guess only a cupcake with a chocolate covered pretzel 🙂 Thanks for sharing!